Sticky Mosaics by Orb Factory are just blowing away the competition. Not only did they rank at the top for girls’ arts and crafts toys, but some storeowners reported they were the best-selling item in the store. Also tops in crafts were Creativity for Kids, especially the Fashion Design Studio for girls and Klutz books for all kids. Overall, boys need a hing to move before they move it off the shelves. Boys like cars and other vehicles, and the idea of designing their own wheels appeals to them. Also continuing to be strong are Iwako Japanese erasers by BC Industries and Playmobil. Obviously, storeowners are looking for new things at Toy Fair 2009. Specifically, they are searching for items that would make their stores more relevant in today’s marketplace. Deran Mukjian, owner of Catch a Falling Star in Lexington, Mass., said that with many children growing out of toy stores younger and younger, he wants to find toys for infants. Boys continue to be a tricky subject for craft items, but products with bugs are always a hit. For several retailers, Shrinky Dinks were popular for both boys and girls; they probably have a retro factor as well. Jewelry and fashion continue to be strong for girls. 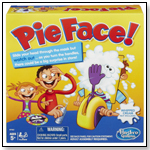 Games such as Bananagrams, Quirkle by Mindware and Family Time Dinner Games continued to be strong sellers through the Christmas season. When it comes to arts and crafts, the focus is mostly girls. And right now, Sticky Mosaics and other items from The Orb Factory are selling the best. Many specialty toy-store owners are surprised and delighted that the item came out of nowhere and is doing so well. When it comes to games, Blokus still seems to be popular, and the new 3D Blokus also seems to be popular, though most retailers are pretty angry that the game they made popular has now been bought by Mattel and is in mass-market stores everywhere. PlasmaCars by PlaSmart are still hot. 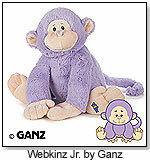 Only one of four retailers surveyed still counted Webkinz by Ganz as a great seller. Of these retailers, the two who are going to Toy Fair 2009 are looking for lower-priced items because of the economy and European toys to minimize the risk of recall problems. Harry Potter’s Light Wand and a Fart Machine were each mentioned by one retailer, but the manufacturers were not specified. Standards such as Sticky Mosaics and Plasma Car remain strong. New hot toys are Elf on the Shelf by CCA & B LLC, Air Pogo by Hypergee Inc., and Rolit and Exago by Goliath Games. One of three retailers going to Toy Fair 2009 will be looking for music, art and safe infant and toddler toys. Another is searching for companies that are easy to do business with. Most retailers felt as though many craft items are marketed more toward girls. Orb Factory Sticky Mosaics are strong for both girls and hard-to-please boys. Fashion items are also very popular for girls. Responses to the upcoming Toy Fair 2009 in New York were mixed, with some retailers saying they had not yet decided whether to attend. The most important thing for most retailers who are either planning to attend or have attended in the past is to find new or unique product, and to be able to speak to the companies directly and see the products themselves. This designer-set features a mannequin, sewing materials, a sketch book, yards of fabric, a swatch booklet, trims, a satin dress form, a garment bag and a design manual. Kids can decorate the dress included or create their own dream designs. “This product taps into the energy generated by television shows, such as ‘Project Runway,’ and excites tweens to try out their fashion design skills. The thoughtfulness that went into the selection of materials in the kit makes it ideal for the specialty market,” Lisa Ritchey of Faber-Castell told TDmonthly. Launch date: May 2007. — Terry Meyers, owner of Kaleidoscope Toys in Round Rock, Texas, told TDmonthly that her store “sells several dozen” of this item each month. — “They're all inclusive and that's attractive to customers because they don't need to go out and buy a whole bunch of other supplies,” said John Goehring, owner of The Toyworks in Santa Rosa, Calif., of his top-selling Creativity for Kids crafts in late 2008. — Thirteen percent of 44 retailers listed fashion-related kits as top-selling crafts in fall 2008. 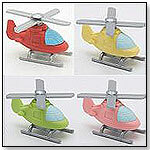 These tiny helicopter erasers come in four colors. — "We sell 5,000+ pieces a month" of the Iwako erasers, estimated Bill Sartain, co-owner of Tutoring Toy in Salt Lake City, Utah, in early 2009. This craft activity kit enables kids and adults to create handmade bag tags, key chains and more. The pack includes an Enchanted Kingdom poster, 32+ traceable images, oodles of Shrinky Dinks plastic, eight color ball chains, and a photo frame keepsake. Shrinky Dinks® is the amazing, shrinking plastic that you draw on, color in, cut out, and bake in the oven to create all kinds of crafty items such as jewelry, bag tags, charms, magnets and ornaments. Launch date: August 2008. Display Ideas: The product is designed to hang or sit on a shelf. Police Headquarters by PLAYMOBIL INC.
Help the Police monitor the Police Headquarters. Prison cell comes with working door lock and breakout window and wall. The Police Headquarters is equipped with surveillance cameras and has a reception area, interrogation room, and a wall for equipment. Also includes three figures and many other accessories. Recommended for ages four and up. Choking Hazard. Small parts. Not for children under 3 years. — David Campbell, owner of Amazing Toys in Great Falls, Mont., likes Playmobil because its products are "not made in China, customers come back for more [and it offers] good play value," he told TDmonthly in fall 2008. Thirteen percent of 52 retailers named the company as a favorite. Webkinz Jr. features its own website where smaller boys and girls can play age-appropriate games chosen by their parents. 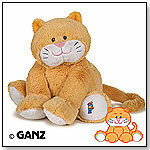 This 12", super-soft Kitty comes with her own secret code that little tots can use to access the online play space. Launch date: Spring 2009. This motion-activated fart alert broadcasts eight verbal warnings while flashing its light. Phrases include "Fart detected; maintain safe distance" and "Warning! Dangerous gases emitted." It comes with two AA batteries. The object of Rolit is to observe, block, and change the balls' colors to your own. The victor is the one who has the most Rolit balls in his or her color. The oversized game board, for two to four players, is perfect for tournaments and schools. The game takes about 20 minutes to play. Exago is a fast game for two to six players. The object is to form a straight line of four hexagonal pieces of the same color. It takes about 20 minutes to play. Casino Hot Dog by HABA USA/HABERMAASS CORP.
doo” or you lose your turn. Players can take a chance and keep going back to the bag for additional chips. At this casino there can be two winners each round. Players move their dog across the board until someone reaches the winner’s circle – the dog house. Designed for two to four players. Launch date: February 2009. Air Pogo can best be described as a pogo on a rope. It gives kids a big bounce in the air instead of on the pavement. When suspended from a tree limb, deck, wooden swing set or any other 8.5' sturdy overhead support with 6' obstacle clearance, the Air Pogo gives children a great ride — swinging and bouncing up to 2.5' without touching the ground. — "Air Pogo [is] suddenly going very well," Charles G. Bonner, co-owner of Heights Toy Center in Little Rock, Ark. told TDmonthly right before the holidays 2007. The Elf on the Shelf: A Christmas Activity Book™ is the companion book to the much beloved The Elf on the Shelf: A Christmas Tradition™. Families, teachers and all who believe will enjoy celebrating the Christmas season with their favorite elf as they play with reusable, full-color stickers, enjoy The Elf on the Shelf games, construct crafts for fun and gifts, sing along with The Elf on the Shelf North Pole singers, and more. This necklace comes on a reusable card, and a portion of the purchase price is donated to a fund that protects animals and habitats. The back of the pouch tells consumers that the "blue speckled blowfish is slowly disappearing from the waters around French Polynesia where it is found." Launch date: 2008.